East coast winter weather forecast: Lots of snow and ice. It’s Almost Winter. How Much Snow Is the East Coast Going to Get? 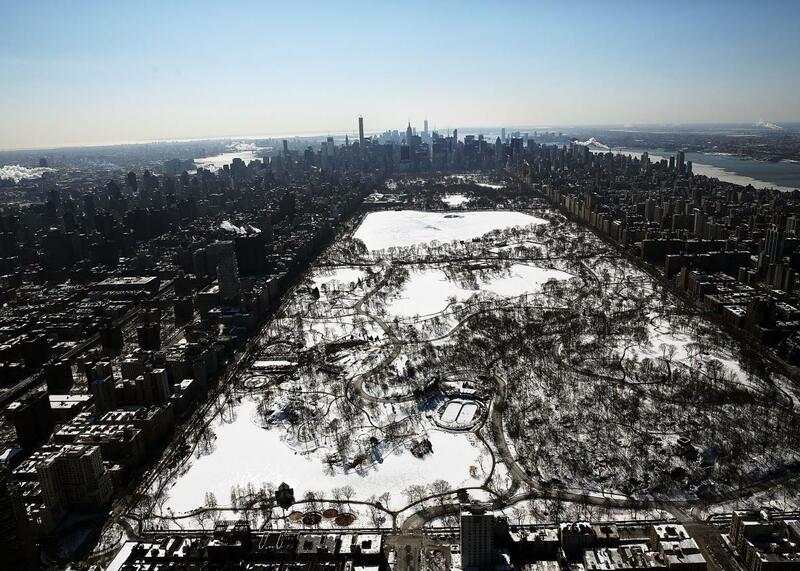 Snow and ice cover Central Park on Feb. 20, 2015, in New York City. Get ready for more of the same this winter. It’s that time of the year again: mid-Autumn, when East Coast snow lovers start salivating and winter grinches begin planning their Palm Beach getaways. Behind all the anxiety (for most of us) and anticipation (for masochists and skiers), there’s really only one question: How much snow are we going to get? In my annual winter weather preview back in August, I wrote that thanks to a superstrong El Niño, this year is special. In a sentence: El Niño tends to supercharge the jet stream over the southern United States, bringing increased chances of rainfall to southern California, Texas, and Florida, and providing more energy for East Coast winter storms—nor’easters, in weather lingo. This year’s El Niño is already one of the strongest on record—NASA climatologist Bill Patzert recently declared it “too big to fail.” That’s really good news for drought-weary California, where there’s been a consistent signal for months now that this winter will alleviate—though not end—the state’s drought woes. (In fact, experts there are now beginning to worry about the risk of flooding—a preview of which hit Los Angeles County on Thursday night.) But for the East Coast, it’s still unclear whether the frequent nor’easters will produce snow and ice, or just lots of cold rain. In its winter outlook, issued last month, the Weather Channel said the odds are slightly tilted toward the former, thanks to a better-than-average chance of blocking patterns—semistable atmospheric anomalies that tend to send cold air toward the East Coast. An early analysis of October snowfall in Siberia—which historically shows a link to how cold it gets during the winter in the Eastern U.S.—argues for pretty much the same thing: lots of snow. Take the Washington, D.C., area as an example: Halpert said there are only two winters over the past several decades when D.C. got less than an inch of snow—1972–73 and 1997–98—and both were strong El Niño years. Neither of those winters featured especially strong blocking on the East Coast, so it wasn’t typically cold enough for the frequent storms to turn into snow. Although 1997–98—the strongest El Niño on record—didn’t bring much snow to D.C., that doesn’t mean it was an easy winter. Several harsh outbreaks of freezing rain hit the East—including a huge January storm that hit New England and Canada hard, becoming Quebec’s costliest natural disaster in history. Of the 20 El Niño winters since 1950, the average snowfall was 35.5 inches, almost seven inches above the long-term average. But when you narrow that down to just winters with a strong El Niño and a strongly negative NAO—meaning lots of cold air in the East—two seasons jump out: 1957–58 and 2009–10. Both were epic snowfall seasons on the East Coast—and averaged 20 inches above normal snowfall in New York City. A quick peek at the current NAO reveals—drum roll please—it’s strongly negative. Now, sure, basing a forecast for a tough East Coast winter on just two past examples is a risky thing to do, but the fact is, there aren’t too many years like 2015 in the historical weather databases. Right on cue, the weather in the East looks like it will be turning sharply colder this weekend, with a good chance of the season’s first freeze in many locations. Bottom line: As it looks right now, the East Coast seems in line for a fairly harsh winter, with plenty of snow and ice, especially for interior parts of New York and New England. If the NAO—which is notoriously unpredictable this far in advance—hangs on and remains strongly negative, you can add New York City to that list. Still, it’s not going to be nearly as cold as the near-record chill of last winter, especially in Boston and the rest of New England. The mid-Atlantic is the wild card in this whole winter forecast. There’s a good chance the D.C. area gets spared the worst of it, but as for the rest of you, I’d invest in a snowblower if for some reason you didn’t buy one during last year’s winter wonderland/hell. *Correction, Oct. 16, 2015: A previous version of this post misidentified the North Atlantic oscillation as the North American oscillation.